Due to a childhood accident with a folding knife I became a fixed blade only person since. I’ve never found much a small fixed blade couldn’t do and I carried one up to the Army, in the Army, and every day since. In truth, a knife IS a multi-tool if you are willing to beat on it enough. Thru a kasetorganic.com, I recently ended up with an early, red Alox farmer. I had no idea the Farmer was one of the best loved models. But I can agree it’s a great one. The tiny SAK’s appear like toys to me, and the ones with a Folding Knife Farmer widgets on it seem like they belong in a glovebox. I added a “clip draw” so I can clip it to my pocket, and started toting it around. My intention was to give it a try and I didn’t expect a lot of it. My surprise is that the saw is incredible, the knife blade is very easy to put a super sharp edge on, and the awl is an incredible fire steel striker. In the past month or so I’ve been carrying it, I’ve yet to need the can opener, or either screwdriver, but the bottle opener does work well, I can attest to, lol. Will I ever give up Folding Knife Victorinox Farmer carrying a small fixed blade daily? No. 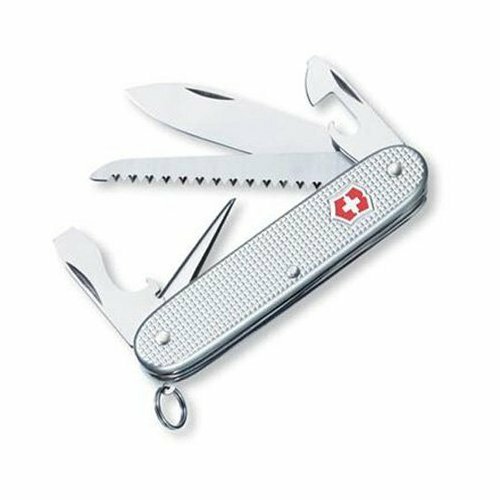 I enjoy knowing I have a tough survival tool or SD tool close at hand, but have my eyes been opened to the wonderful Folding Knife Victorinox Farmer they have. It’s a journey and for now. the Folding Knife Victorinox Farmer and I are traveling together. Out of all the Folding Knife Victorinox Farmer, the Farmer has to be my favorite. Nice and razor sharp out of the box. Very pocketable with useful tools. Dismiss the idea that these are mere novelty items (Folding Knife Victorinox Farmer), a true mini-workhorse. I used the wood saw to cut down a few small diameter trees in my backyard, and the bottle opener used mainly to open my favorite beers, has been used as a light pry tool. Very affordable, warranty, easy to re-sharpen, tough, and classy looking Folding Knife Victorinox Farmer and go get it!